With the Hong Kong Tatler team on location at SIHH 2018 in Geneva, we bring you our top watch highlights from day three of the luxury watch fair. Imagine an entire watch—movement and case included—measuring just 2mm thin, or to put it in perspective, just about the width of a strand of hair. This is precisely what the Altiplano Ultimate Concept, Piaget’s first-ever concept watch, accomplishes. There have been other brands who have, at least momentarily, broke Piaget’s ultra-thin records but this one puts a rest to them all. Here, Piaget manages to pack all of 283 components within a 2mm-thin revolutionary, two-layer construction that holds five patents. While one can’t actually own this piece, it demonstrates what the “king of ultrathin” can achieve, and what we can expect to trickle down to its product lines in the coming years. It’s been eight years since the first L'Astronomo model was introduced and this new model certainly makes it worth the wait. Dedicated to Florentine genius Galileo Galilei, the L'Astronomo collection is where the brand can push the boundaries of traditional high-end watchmaking, but still offers its avid fans a “very Panerai” watch. Like the first, the L'Astronomo Luminor 1950 Tourbillon Moon Phases Equation of Time GMT is made to order. Everything from the type of metal to use, finishing, down to the colour of the hands can be handpicked by the owner. What’s more, the movement is personalised to operate according to the geographical coordinates of a city chosen by the client. This bespoke piece carries the same set of functions as the original L'Astronomo, and in addition, a GMT function, a moonphase indicator, and an original system for displaying the date using polarised crystals. Now if you want an unconventional astronomical timepiece, this would certainly be it. Naturally, everyone was looking forward to what newest SIHH tenant Hermès had to offer and delightedly, they did not disappoint. On its debut, the luxury brand revives the Carré H, a line Hermès first introduced in 2010, then a limited edition designed by Marc Berthier and produced primarily titanium in a 36.5mm wide square case. This year, Hermès relaunches the Carré H with a new case size and dial, and as it is crafted from stainless steel, is offered at a more accessible price point starting at only over HK$60,000, less than half the price of its predecessor, then sold at about HK$117,000. This year’s re-edition sees a more symmetrical dial—with all hours presented in double digits—an addition of a pendulum-inspired sweeping seconds hand and a slightly bigger case at 38mm wide. This is one watch fashionistas would appreciate. 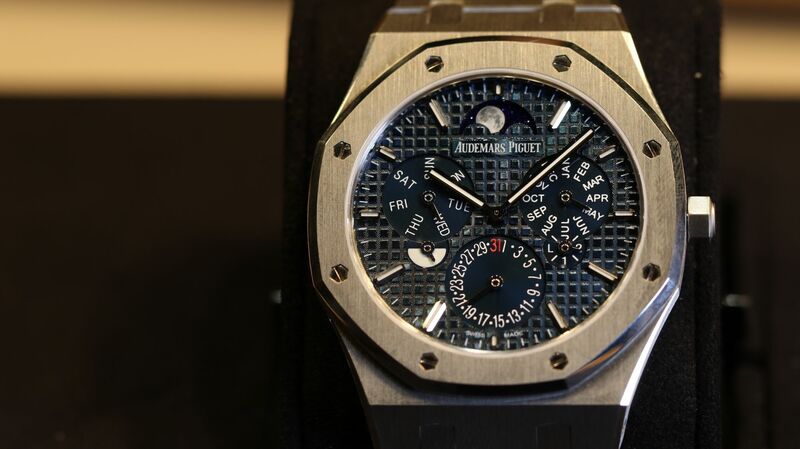 A few steps down from the booth of Piaget, where the brand proudly revealed its latest ultra-thin record, was Audemars Piguet, the Las Brassus watchmaker who this year did some serious did some serious slimming too. Enter this year’s Audemars Piguet’s star—the Royal Oak RD#2 Perpetual Calendar Ultra-Thin, which holds the thinnest automatic perpetual calendar today. In reducing the thickness of the overall watch down to an astounding 6.3mm, Audemars Piguet has created a complicated watch even slimmer than their current ultra-thin time-only model: the 8.1mm-thick Royal Oak Extra-Thin. The RD#2 is crafted in platinum, with a blue grande tapisserie dial, and promises a 40-hour power reserve. And I promise you, this is one Royal Oak you would want to add to your collection. Don't forget to follow us on Facebook for all the latest stories and photos. Stay tuned for more SIHH updates! In case you missed it, here's the Day 1 and Day 2 highlights.